allround geek: Another badass poster for "The Expendables"
Another badass poster for "The Expendables"
A week after the first poster was released, and here is another great poster for The Expendables, the ultra macho new film by Sylvester Stallone with the "creme de la creme" of action movie stars! 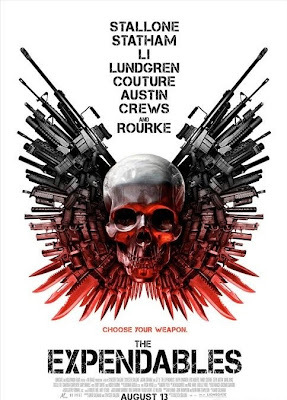 I especially like the "Choose you weapon" tagline, which suggests that each of these men is a killing machine; an angel of death if you will. Something tells me that this film will have a very high body count. Back to back posts for the Ultra-macho man, Eraserheadx, for the first time ever. You are the man! he he he. Watch your rss feed lads. I'm on fire!